As the unease wrought by the US-China trade war recedes into the background, real estate markets across Asia rung in the new year on a positive note, with friendly government policies, tax reforms and infrastructure spending propping up demand. With sentiment improving, investors are seen diversifying away from more traditional sectors such as office space and housing into areas such as data centres and warehousing, while new developments are cropping up farther away from long-established and rapidly saturating real estate hubs. The development sector saw the largest deal for Beijing in Q1 come through, with Sunac acquiring the Oceanwide’s portfolio in Q1. The value of the Beijing component, Land No.1 of Beijing in Haidian District, is estimated to be about USD3 billion. Development projects, especially those with a residential component, will continue to be popular investment targets, while the positive outlook for Chengdu’s retail market will also attract investors. 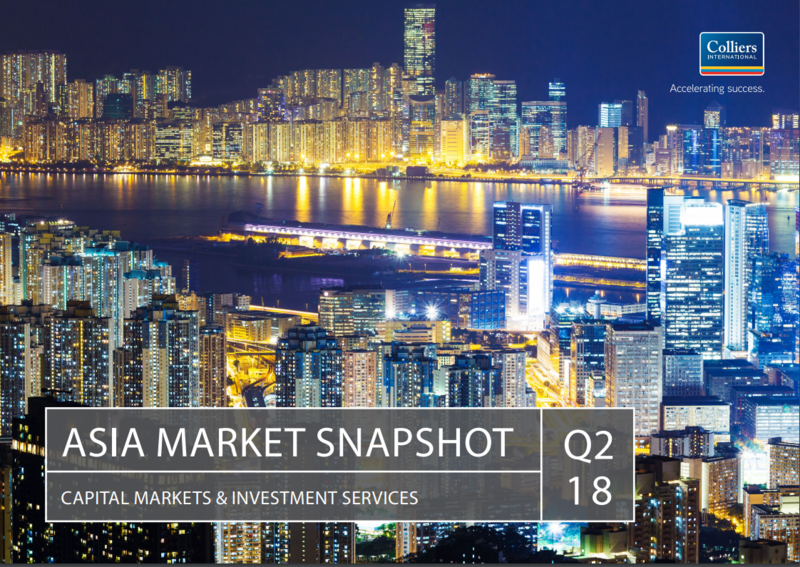 Despite the recent slowdown in Hong Kong’s property market, activities such as transactions in the core CBD have proven that demand persists across the city in Q1, with investors regaining confidence and responding positively to reduced prices. Canadian pension fund Caisse de dépôt et placement du Québec (CDPQ) continues to bet big on Indian companies, as evidenced by its most recent investment of Rs1,800 crore (USD250 million) in the non-banking financial arm of Edelweiss Group. With speculative property investment likely to remain on hold as a result of the upcoming presidential election and Muslim fasting month, investors can expect an uptick in the residential and logistics sectors, as well as in the co-working space. 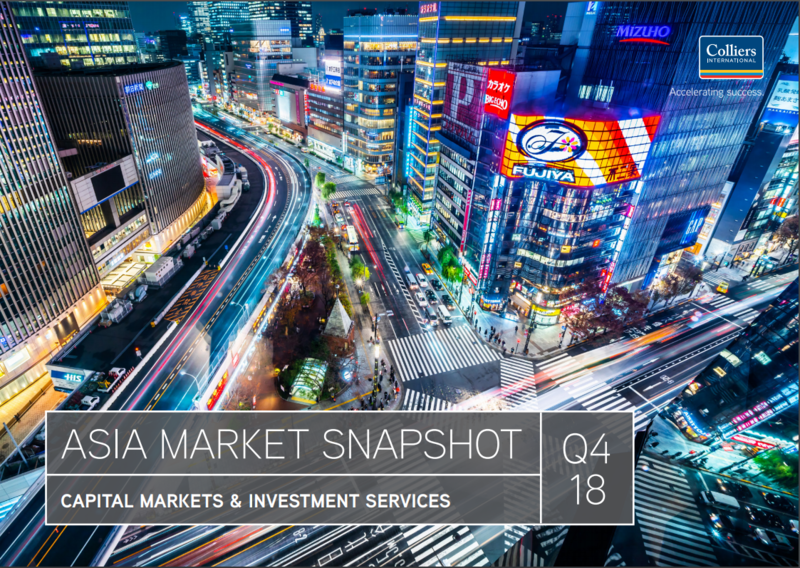 Cities with a higher number of underutilized assets, such as Osaka, may offer more attractive opportunities for investors seeking steady income production. Overall, the logistics market continues to show strong investment returns, setting a positive tone for Q2 2019. 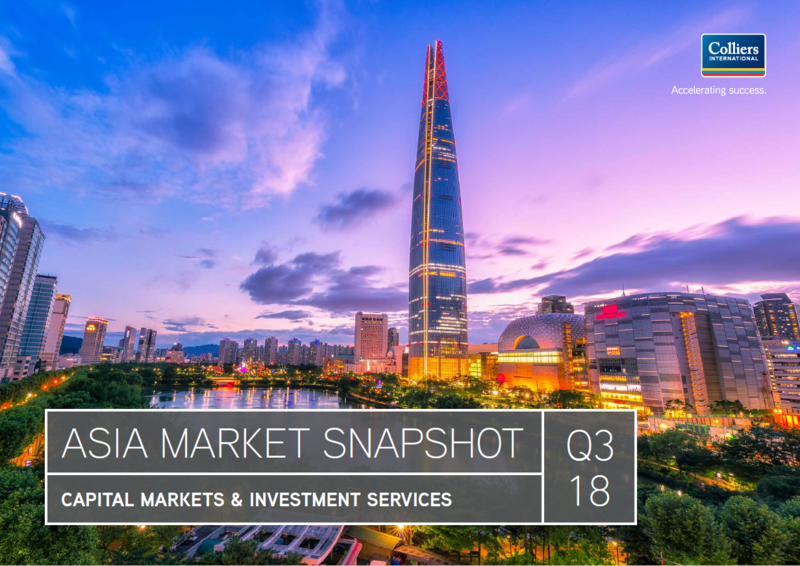 Despite a high demand for core assets across the board that is being driven by competition among home and overseas investors, Korea’s office investment market retained its strong momentum in the first quarter of 2019, as indicated by its healthy transaction record. The liberalization of industries such as banking & insurance, as well as wholesale & retail activities, are expected to further facilitate growth in the office and retail sectors, resulting in better quality spaces and a stabilization of rental rates in these sectors. The retail sector was the major focus of the PRD investment market in Q1 2019, totalling USD1.22 billion and accounting for 77% of the total volume. This quarter’s biggest deal was the purchase of Shenzhen’s Central Walk Mall by Hong Kong’s Link REIT for USD985 million. Over the past three years, the Metro Manila office market has witnessed a diversification of its tenant base. The outsourcing sector remains strong and is likely to contribute between 20% to 30% to total office space take-up in 2019. Positive developments, such as the announcement of Shanghai’s GDP topping all other cities in China, as well as the release of the government’s project investment plan involving 138 projects in 2019, have boosted investor confidence. 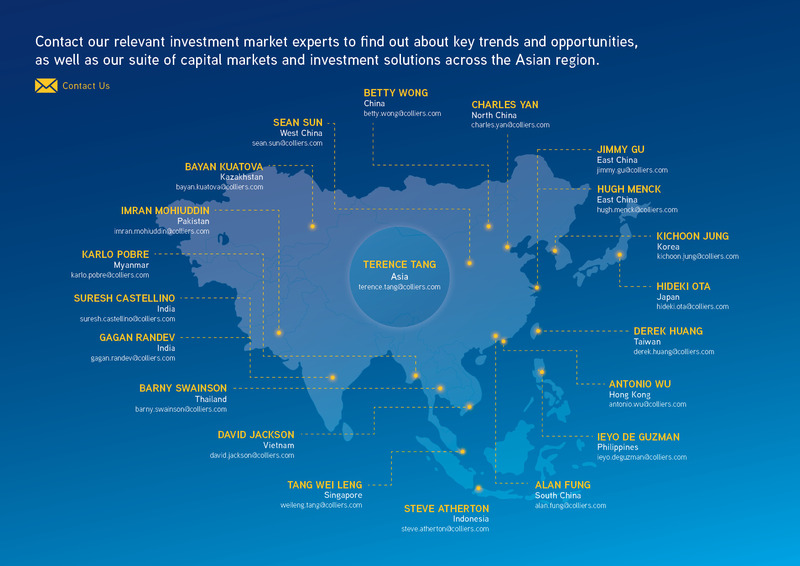 The city remains the most attractive investment destination in China. 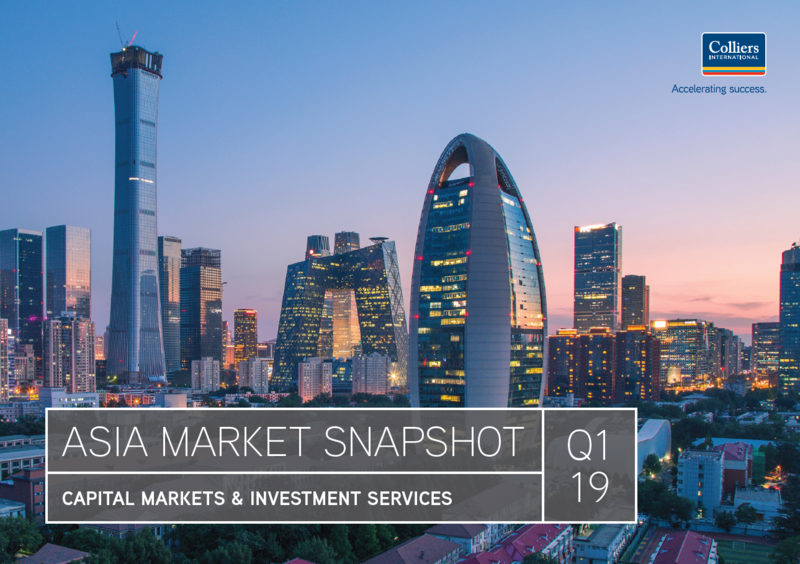 The city-state’s hospitality sector continued to grow in Q1 2019, driven by keen interest from investors and developers who shifted their focus to non-residential sectors. The keen interest in commercial assets is expected to continue in Q2. Improving market sentiment led to a slight increase in total commercial property transaction volumes in the first quarter of 2019. Self-use buyers remain active in the office and industrial sectors, as investors continue to focus on these asset types in Q2. With general elections underway, stability remained top priority for real estate investors in Thailand. The large number of commercial construction projects currently underway in Bangkok and elsewhere in the country saw real estate investors shifting their focus from signing new capital commitments to existing ones. As Vietnam’s economy continues to grow rapidly, the industrial and office sectors continue to be top-of-mind for investors in the country. Growth is expected to be on the uptick for the industrial (factory and logistics) market in the West, North-West and South-West of Vietnam.